Hello fall! 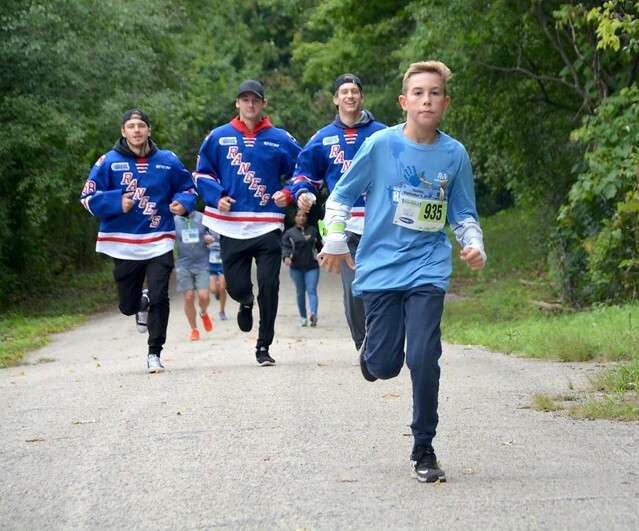 On a crisp September morning, the 5th Kitchener Kids with Cancer Run & Walk was the place to be. Thank you for your support! What we love about our sport is the opportunity it provides for people to come together and rally around a cause. Sometimes it’s the trail, or the distance, but during pediatric cancer awareness month, this one is special. This race is an annual fundraiser Pediatric Oncology Group of Ontario (POGO), and it shows through every aspect of the event. From the committee led by Dr. Jodi Rosner, this event is planned around the heroes of pediatric cancer. Again this year, records were smashed, with over 550 participants and over $68,000 raised! Congratulations to the runners and walkers of today’s 5 km and 10 km events, and 5 km untimed event. Full results are available at results.runwaterloo.com. Over 1,000 free photos have been posted to our Flickr page for you to enjoy! For additional photo features, check out the timed results. Every runner has a video camera icon that will show them crossing the finish line, and if you have a photo camera, you’ve been tagged in photos! Although we’ve been a part of this race for several years now, this was our first official year with Run Love. We had a great year working with our charity partners to create memorable running events that are major fundraisers. Thanks for having us along for the ride! Had a great time! PLEASE add portable toilets next year. Thanks for the feedback. We will absolutely address this in 2019! Thanks for your positive feedback! See you next year!